Every Friday, we bring you Offal of the Week: an up-close and personal look at one of the less-familiar parts of the animal. Delivered fresh by Ryan Adams of the blog Nose to Tail at Home, we highlight a different cut of meat that you've always wanted to make, but were afraid to ask your butcher for. This week: Marrow. Anthony Bourdain, in particular, has mentioned various times in multiple venues that he would most like his final meal to be roasted bone marrow with a caper and parsley salad. Here is a man who had eaten food from all over the world, from three-Michelin-star restaurants to the most robust street food in some of the poorest countries. So many foods in his repertoire of eating — and yet he is completely sure that he wants his last bite ever to be simple bone marrow. It wasn't until I made the bone marrow myself (it's the only item on the menu of Fergus Henderson's St. John restaurant that is never removed) that I understood his decision. It is indeed, as Bourdain once proclaimed, "God's butter." Bone marrow is the flexible tissue that fills the hollow interior of bones, and can be found in two varieties, red and yellow. Red marrow produces red and white blood cells, while yellow consists of mostly fat and is thus coveted by gastronomes. According to bone and fat enthusiast Jennifer McLagan, [whose Beard Award-winning cookbook Fat is reviewed here on EMD] marrow "... is full of minerals and good fat. Queen Victoria ate marrow every day and, while she may have had a full figure, she lived to be 81." Studies back her claim up, showing that marrow is a good source of protein and is high in monounsaturated fats which decrease bad cholesterol levels. Since the bones have to be large enough to contain enough marrow to make it worthwhile, most marrow preparations call for either veal or cow, though I've heard some amazing things about tuna marrow. And, like most cuts of offal, it's more common than you might think: the Vietnamese use beef marrow as a base for their awe inspiring, world famous noodle soup dish, phở. The native Americans used marrow in the making of Pemmican. 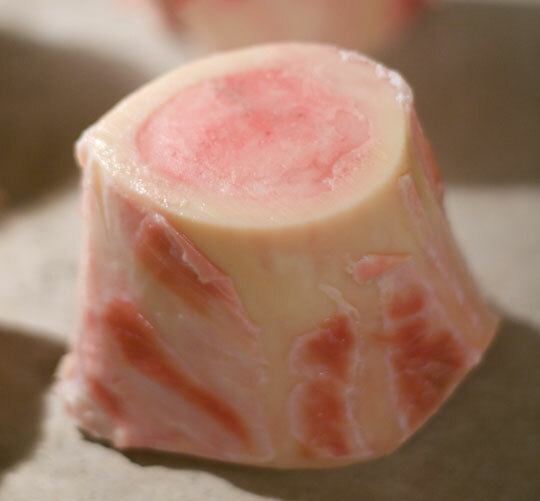 In fact, the very word "ossobuco," the Italian veal shank preparation, literally means "hole bone," referring to the appealing marrow that's in the center of the bone-in cut. When roasted, marrow has a jelly like texture that coats the mouth and leaves the lips sticky with fatty goodness. You can also deep fry marrow with excellent results, or add it to dishes to enrich them. To find marrow (which is sold most commonly as large cross-sections of straight-shaped leg bones, from which the marrow needs to be removed) check your local butcher or Asian market, and a Whole Foods representative has told me that they carry it as well. It's also possible to find spectacularly fresh marrow if you're friendly with a local ranch or slaughterhouse, or — a little easier to attain — near a farmers' market where fresh meat is sold. The last time I got a huge bag of marrow bones it set me back all of ten dollars, so it won't empty your wallet. They keep for a few days in a cold refrigerator; they can be covered with water to keep from drying out.